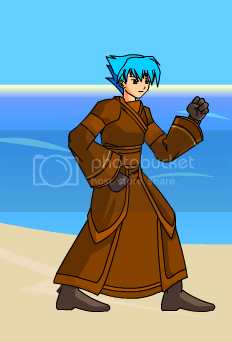 Location: Talk to Yulgar in his Inn » Starting Gear » Armors. Taking the Student's Robes semi-permanently will cost 20 Z-Tokens. While you have this armor, Adventurer Shield, and any of the Adventurer no-drop weapons equipped, all your player attack and spells deal 102.59% damage and gain +2 BTH*. *The synergy of your equipment grants all of your attacks +2 BtH and increases damage by 2.59%! Simple robes offering good all round defence. They slowly improves with you as you level. Image thanks to Crimzon5. Numbers thanks to In Media Res. Set Bonus message thanks to Mark Chung. Also see Cloth Robes, Leather Armor, and Steel Plate. Simple robes offering good all round defence. Power up at level 40. None until Level 40, when the armor grants a +3 BtH on all Player and Spell Attacks. Info from Kalanyr (via Crimzon5). Picture courtesy of Crimzon5.